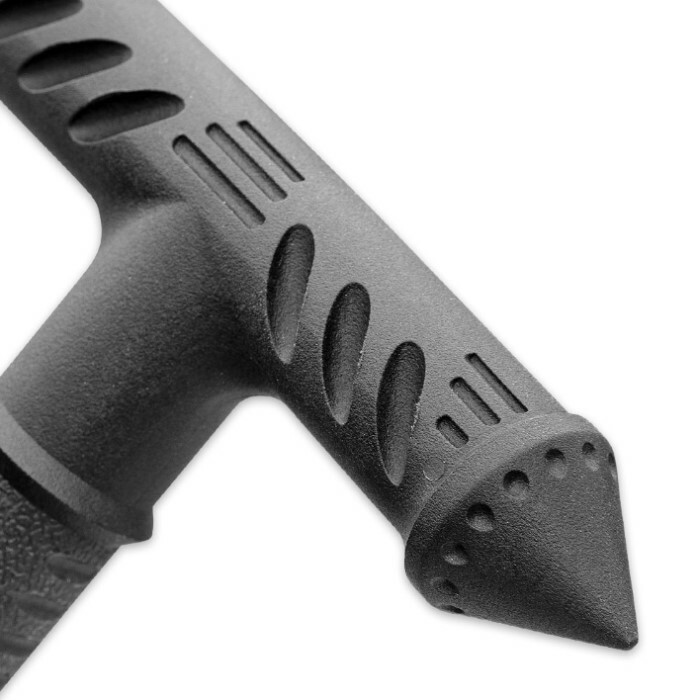 New from United Defense is the tough and ready Survival Staff Walking Cane! 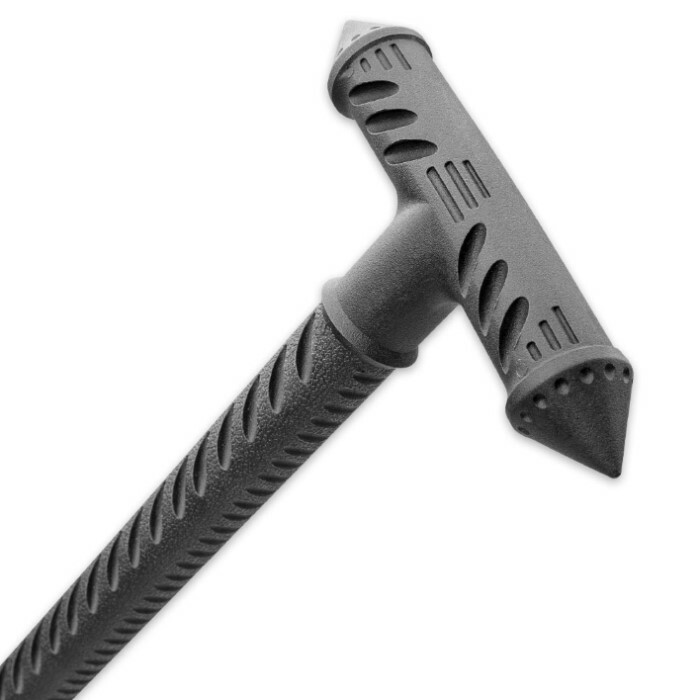 The staff is constructed of strong, injection-molded nylon with fiber and has a textured, T-grip handle for that rock-solid hold you need. The handle is also double-tipped for maximum versatility of use in self-defense. The staff features a removable rubber toe to give you secure, slip-free footing when walking. The United Defense Survival Staff Walking Cane will extend your self-defense advantage by more than three feet. Guaranteed, they won’t get too close to you! you WILL NOT get a 3/4th rubber tip on this cane. if you do, you will see why it won't last. i highly siggest getting a standard cane grip or a 1" grip and filling any space with gripping agent like tape or glue. cutting the soft rubber off wont be a problem after. otherwise still a good buy, the handhold is very rough though, so expect calluses if you dont already have them in the same spots. If you need an actual walking can YOU WILL need to change the tip to a RUBBER tip. This tip on the cane is PLASTIC and will slip on a smooth surface and especially on a wet surface. Just unscrew the tip and replace it with 3/4 Inch RUBBER tip; other that this problem the cane is AWESOME. Feels very solid, and the only joint is where the end cap is screwed on. Which means no where for water, sweat, or blood to get in and ruin it. Only complaint is that it feels about .5-1 inch short. I'd definitely buy another, if needed! This thing is just perfect. The construction feels even more solid than similar United and Cold Steel products, which are plenty durable already. The head shape is easier to actually use as a cane, while the points make it more viable as a self defense tool and requires much less strength to do damage. 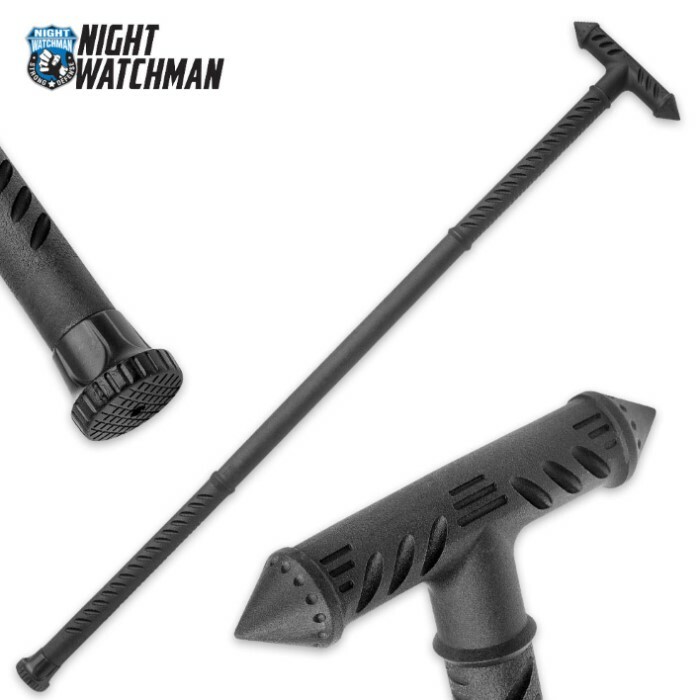 It's also half the price of the next best defense cane! The only downside is the ridged texture that could wear on your hands if you swing it around a lot. I reccomend this to anybody, whether you need a cane to walk or not. I wanted a new cane as I am disabled and like variety. My favorite is the C.S. polypropylene dragon. But at times it is too heavy to carry. I am a large man and need a solid, unbreakable cane. When I saw this at BudK at such a steal, I ordered it right away when it came into stock. It is light and small in the hand but very strong. Just the thing. I would caution you the cane tip is useless. When it arrived I put it on my hardwood floor and leaned on it to see if it would slip and it sure did!. I unscrewed the tip only to find the tip was barely held on by the very tip of the screw. The good news is that a regular rubber cane tip, available at any pharmacy, fits fine. A new longer screw and I have a keeper. I cannot recommend this cane enough. It is a tough cane you will have for decades.